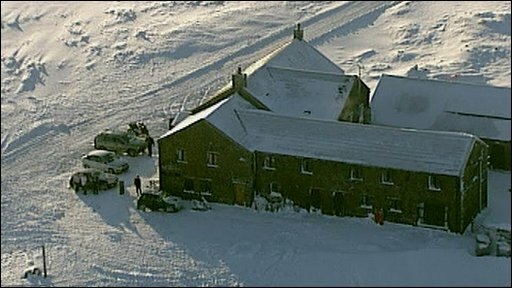 Guests celebrating new year at the highest pub in England had a longer than expected stay, after heavy snow left them stranded for three days. About 30 people arrived at the Tan Hill Inn in North Yorkshire on New Year's Eve to welcome in 2010. But the wintry weather conditions meant the residents were snowed in for a further two nights. Resident DJ Peter Richardson said: "We've kept our spirits up. It's actually been quite heart-warming." The Tan Hill Inn stands 1,700 feet (520m) above sea level in the Yorkshire Dales. Mr Richardson, from Richmond, North Yorkshire, said there had been a strong sense of camaraderie among the guests, who had come from across the UK. "People have been helping peel veg for the dinner and pitching in," he said. "We've also held quizzes." Guest Paul Manson, who lives near Alnwick in Northumberland, said: "Everyone's been chipping in by doing the washing up, peeling potatoes, getting cars out of the snow and keeping the generator going." A manager at the pub said morale had remained high. "It snowed heavily throughout the night on New Year's Eve, but no-one gave it a second thought until the morning when they couldn't move their cars," he said. Guests began making their way home on Sunday, after gritters and snow ploughs arrived and cleared the roads.